For many moms, the beautiful blessing of pregnancy brings with it the priceless addition of a baby. But it also can bring many unwanted and unpleasant symptoms as well. 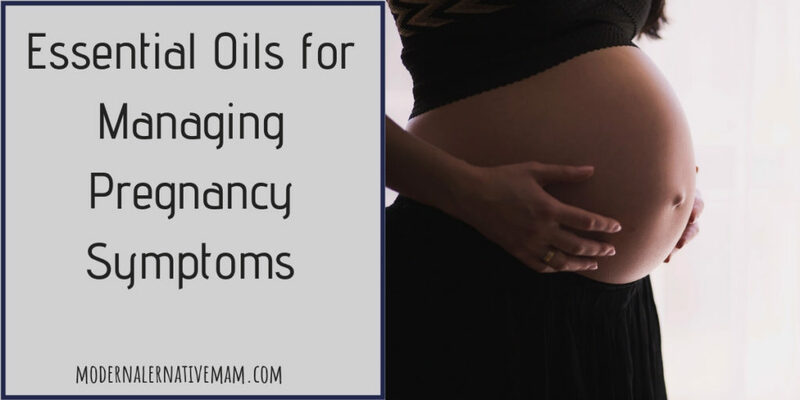 Though pregnancy side effects can be difficult to deal with, if you know how to use essential oils for pregnancy symptoms, you’ll find that pregnancy doesn’t have to be difficult. Let’s take a look at how to use essential oils for managing pregnancy symptoms. Each essential oil has it’s own helpful set of healing properties and is useful for dealing with multiple ailments. Pregnancy is no different. Essentially, (pun intended 😉 ) the molecules in the essential oils, send messages to the brain to cause the body to react in a certain way, thus creating a (hopefully) positive reaction against the unwanted symptom. Remember never to ingest essential oils. Read this post to find the right ways to use essential oils during pregnancy. Are Essential Oils Effective for Treating Pregnancy Symptoms? Many expectant moms have found that using essential oils for managing pregnancy symptoms to be very effective. For instance, a sniff a lemon, might calm a queasy stomach. Other oils, like lavender are useful for helping a new mom relax and rest. Are Essential Oils Safe for Pregnancy? Not every oil is safe for an expectant mom. In fact, many could even be dangerous. That’s why it’s very important to only use breastfeeding/” target=”_blank” rel=”noopener”>essential oils that have been deemed safe for pregnancy. And also, exercise the age old adage; “When in doubt, don’t” It’s never a good idea to use an essential oil for pregnancy symptoms if you aren’t absolutely certain it is safe for both you, and the baby. Which Essential Oils You Should Avoid During Pregnancy? The most common essential oils to avoid during pregnancy include, fennel, pennyroyal, clary sage, partly seed or leaf, marjoram, wormwood, tarragon, tansy, caraway, sage, cinnamon, aniseed, thuja, hyssop, camphor, oregano, mugwort, birch, wintergreen, and basil. This is not an exhaustive list so please proceed with caution. In any case, just because an essential oil is considered safe, doesn’t necessarily mean it is safe for you. Always start slowly with essential oils, paying close attention to whether or not you have an allergic reaction. With the proper precautions, you should be able to safely use essential oils for managing pregnancy symptoms. 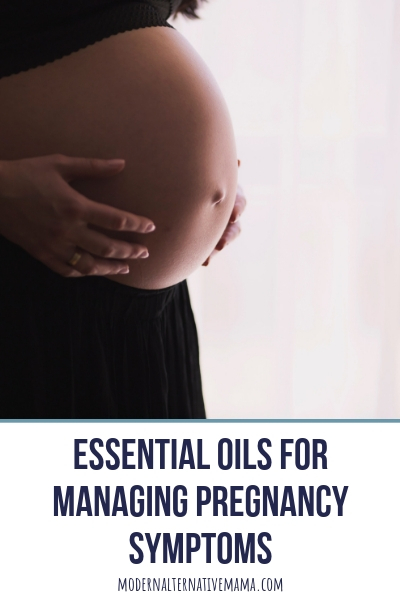 Now that we’ve talked about essential oils and their efficacy for managing pregnancy symptoms, let’s talk about some common pregnancy symptoms and the essential oils that can help manage them. No mommy should have to suffer! Morning sickness is probably the most common pregnancy symptom, and one that almost every pregnant mom will experience at some point in her pregnancy. German chamomile, lemon balm, grapefruit, peppermint, spearmint, lemon, sweet orange, lavender and ginger are all very effective in helping treat morning sickness. The added strain of extra weight, along with an ever changing and growing body will often cause a new mama to have muscle aches. She may even experience muscle cramping and charlie horses, often during night. In this case, there are a few options that are effective. Frankincense, ginger, and German chamomile, are good choices. Unfortunately, hemorrhoids can be a nasty pregnancy symptom and one that should not be left untreated. Hemorrhoids can cause extreme discomfort for the expectant mom. Thankfully, there are several good options, including, lavender, cypress, tea tree, and geranium. Likewise, constipation can be equally as irritating and uncomfortable, causing stomach pain and general discomfort. For constipation, turn to German chamomile, bitter orange, and mandarin. Pregnancy can make even the most docile woman turn into a fire-breathing dragon! If heartburn is an issue, then spearmint is a great choice. An expectant mama is constantly expending energy in order for her baby to grow. As a result, exhaustion is not uncommon. If that is the case, then using lemon or grapefruit is a good idea. With raging hormones, and over all discomfort, it’s very easy for a new mom to have ups and downs in her mood and that’s completely normal. Essential oils can help raise the spirits. Try cypress or neroli to help stabilize the mood. It goes without saying that with morning sickness, there’s usually a lack of appetite. But since it’s important for the new mom to consume the right nutrition while pregnant, lack of appetite can be a problem. Try using ginger. Despite feeling exhausted, an expectant mom might feel like she just can’t sleep. The body changing, along with feelings of anxiety might make sleeping difficult. If that’s the case, then try using frankincense, lavender, rose, bergamot, or mandarin. There’s always so much to worry about as a new mom. Sometimes those fears and worries can be hard to calm. Thankfully, there’s an oil for that! Actually there are several. Again, lavender is an excellent choice, as well as neroli, and german chamomile. Having a headache while pregnant can be maddening. It’s difficult to navigate the day with a terrible headache. For headaches, try german chamomile. As you can see, there are many essential oils that can help manage pregnancy symptoms. As an added bonus, several can be used for different symptoms, allowing you not to have to purchase hundreds of oils, but rather a few good oils. Which essential oils for managing pregnancy symptoms do you like to use? Which oils have been the most helpful in treating your ailments?